Developed for Native Instruments' free Kontakt Player, the 30GB (50GB uncompressed) Master Edition combines all the raw audio and 2,000+ presets from the first eight critically-acclaimed DRONAR modules into one huge beast of an instrument plug-in. Create rich and dramatic atmospheres from a very small number of notes played. 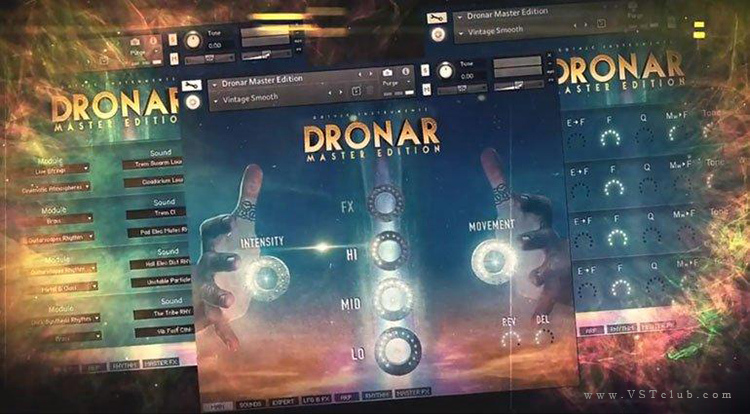 DRONAR automatically spreads out the chord in the mid-range, adds a root bass note, a high note and then adds evolving sound effects. The eight simultaneous different sounds are then animated with LFOs, a rhythm sequencer and arpeggiators to bring them to life. What’s more, this sonic complexity from one hand frees up the other to expressively control dials with mouse drags or external MIDI controller knobs, and record the changes as a performance in your DAW.